The Weekly Adoption Shout Out arrives again following a very busy week for Vicki and Sarah on the #WASO team. I’ll let you all into a little secret, actually not much of a secret anymore, we are developing a new website called The Adoption Social launching on Friday June 14. It will be the new home of The Weekly Adoption Shout Out but it will also have so much more to offer, to read the Press Release we sent out this week click here. You can always keep up to date with what is going on via our Facebook page too. 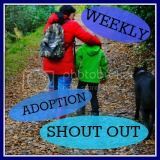 So, exciting times for The Weekly Adoption Shout but for now we are looking forward to reading your posts from the week. Some of you may have taken up our theme of Treasured Moments, but if you haven’t that’s fine please link up your posts as well. The theme is always optional. Again we try our hardest to share your posts on Twitter and on Facebook but you can share yours and other peoples as well with the hashtag #WASO. Those of you posting blogs will no doubt agree it is always good to get feedback and comments on your posts so if you can remember to comment of some of the other blogs that would be great. As always both The Puffin Diaries and The Boy’s Behaviour are hosting, so this linky will appear in both places but you only need to add it once below.